Want to share a funny cat photo? This is the right place to do so. Cats are beautiful little beasts. And they can be quite hilarious, too. Their lovely form, mysterious temperament and mischievous nature have inspired artists (including photographers) throughout history. You will find a great deal of books featuring cat pictures. But you don’t have to be a professional photographer (or artist) to share your cat’s funny antics with the world. Below you will find a form which you can use to submit your funny cat picture. You can add a caption and/or the story behind the picture. I love looking at funny pictures of cats. They always put a smile on my face. And since the advent of digital cameras, I can’t stop taking so many pictures of my cats. I know many cat lovers share this "obsession". That's the reason why I created this page, so cat lovers can share funny photos of their cats with the rest of us. So come on and share your funny cat pictures. See the photos shared by our visitors. Have a Great Funny Cat Photo of Your Cat? Do you have a funny cat? Have you captured her funny moments on your camera? Do share! Besides his big soft paws, Buster is best known for his wonderful whiskers. They're so long and seem to go off in their own directions. 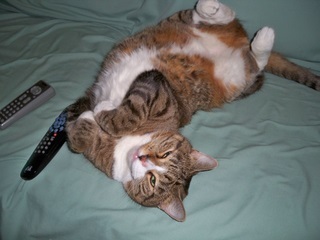 my norwegian and tabby cat --- Note from admin : Click on each thumbnail to enlarge.